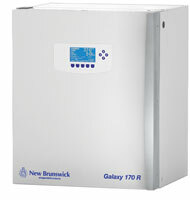 Full-featured R Series CO2 incubators are available in 170 Liter (6.0 cu. ft.) and 48 Liter (1.7 cu. ft.) capacities. These advanced lab incubators incorporate the 133mm [5.3”] intuitive LCD interface and full choice of optionsallowing for a customizable unit with user-friendly control, alarm and logging features. Ideal applications include cGMP and IVF work, stem cell research, cancer research as well as traditional and non-traditional cell culture. 72-hour continuous data logging of temperature, alarms, door openings and CO2, O2 and RH if required, provides a detailed record of environmental conditions to quickly troubleshoot any unexpected results. Capability to quickly change both environmental and alarm settingsthrough intuitive controller. Diagnostic interface to show system parameters and functions. Password protection for secure programmable settings and alarm setpoints. Full-sized 170 Liter (6.0 cu. ft.) capacity on a minimal footprint (shown above). Advanced controller as described above. IR CO2 sensor with automatic auto-zero programmable function to ensure accurate calibrated measurements. Perforated shelving (shown at right). Sealed inner glass door for atmosphere conservation. Large volume humidification pan with dedicated, independent heater. Quick and comprehensive chamber cleaning made effortless. HEPA filtration of gas supply inlets to ensure sterility. 8-position shelving rack with 4 shelves. O2 Control (choose 1 - 19%, 0.1 - 19%, or 1 - 95%). 4 or 8 Split inner glass doors. Humidity alert package (display and alarm). 48 Liter (1.7 cu. ft.) capacity personal-sized modelson a minimal footprint. Convenient benchtop size and footprint — only 48 x 47 cm [18.9” x 18.5”]. Ideally suited for hypoxic applications including in-vitro fertilization (IVF) and stem cell research, with O2 control option. Integrated, heated, viewing window in outer door allows observation without disturbing cultures. RS-232 and 25mm access port. Significantly lower gas consumption compared to large incubators due to relatively compact chamber size. O2 control (Choose 1-19%, 0.1-19%, 1-95%). Two split inner glass doors. Perforated shelving to facilitate faster recovery after door opening.